Prepare the fillet of beef by hammering it with a meat cleaver, the side of a meat cleaver, the side of a Chinese cleaver or a rolling pin. 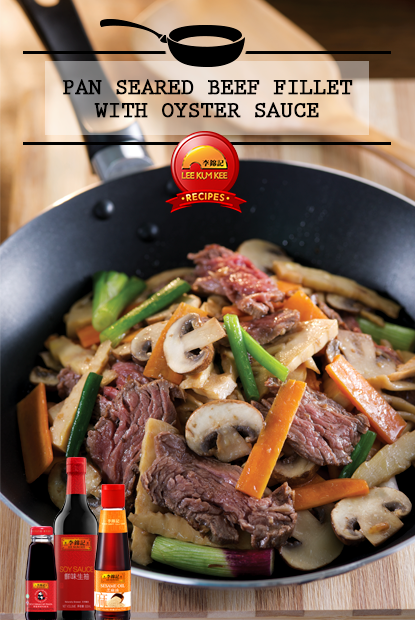 Enjoy the goodness of Panda Brand Oyster Sauce in the new recipe! 1. Slice beef and add in marinade. Marinate for 20 minutes. 2. Blanch mushrooms, bamboo shoots and carrots until cooked. Remove and set aside. 3. Heat up the pan over medium heat. Grease the pan with some oil. Pan-sear the beef roll until desired doneness. Remove. 4. Grease pan with oil, fry the garlic until fragrant. Add in the beef, mushrooms, bamboo shoots and carrots. Stir well, foil in seasoning and stir fry till the sauce thickens. Serve hot and enjoy!